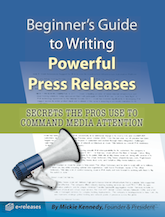 Also features tips on what to do after you have distributed your press release. Please make sure to enter your correct email address so that you will receive your free report. About Us: eReleases offers access to the national newswire used by Fortune 500 corporations at a fraction of the cost. We deliver personal service and exceptional value to every customer, every release, at every price point.